Oxford University Press (UK), 9780199699308, 650pp. 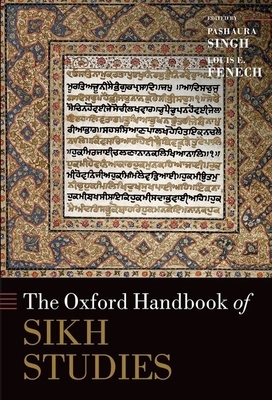 The Oxford Handbook of Sikh Studies innovatively combines the ways in which scholars from fields as diverse as philosophy, psychology, religious studies, literary studies, history, sociology, anthropology, political science, and economics have integrated the study of Sikhism within a wide range of critical and postcolonial perspectives on the nature of religion, violence, gender, ethno-nationalism, and revisionist historiography. A number of essays within this collection also provide a more practical dimension, written by artists and practitioners of the tradition. The handbook is divided into eight thematic sections that explore different "expressions" of Sikhism. Historical, literary, ideological, institutional, and artistic expressions are considered in turn, followed by discussion of Sikhs in the Diaspora, and of caste and gender in the Panth. Each section begins with an essay by a prominent scholar in the field, providing an overview of the topic. Further essays provide detail and further treat the fluid, multivocal nature of both the Sikh past and the present. The handbook concludes with a section considering future directions in Sikh Studies. Pashaura Singh is Professor and Dr. Jasbir Singh Saini Endowed Chair in Sikh and Punjabi Studies at the University of California, Riverside. Louis E. Fenech is Professor of South Asian and Sikh History at the University of Northern Iowa.